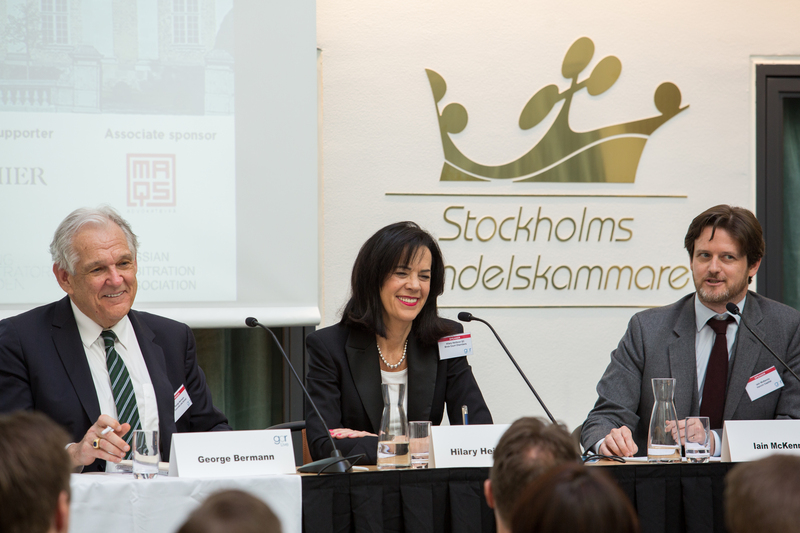 GAR Article: GAR Live Lookback: Stockholm - What makes a good arbitrator? What does ‘good’ look like when it comes to dealing with requests for timetable dispensations, to reading-in, or to handling difficult wing arbitrators? 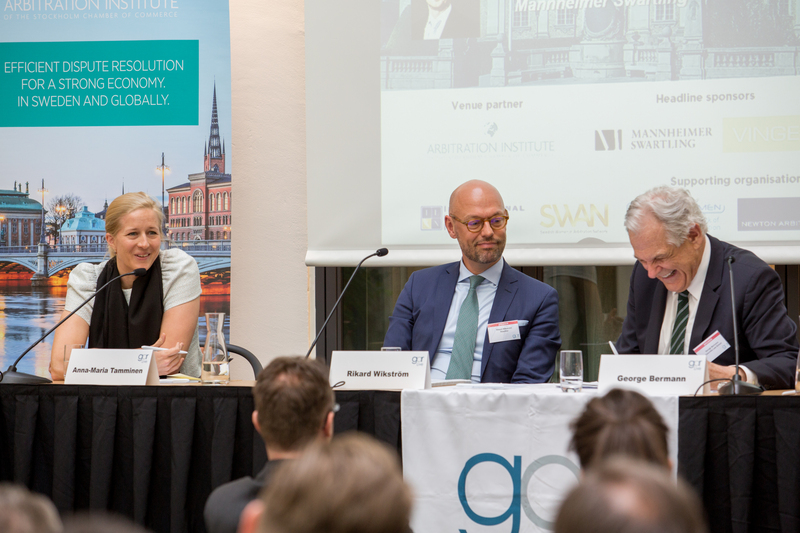 Those questions, and more, were debated in session three of GAR Live Stockholm 2017, which attempted to answer the very big question of “what makes a ‘good’ arbitrator”? 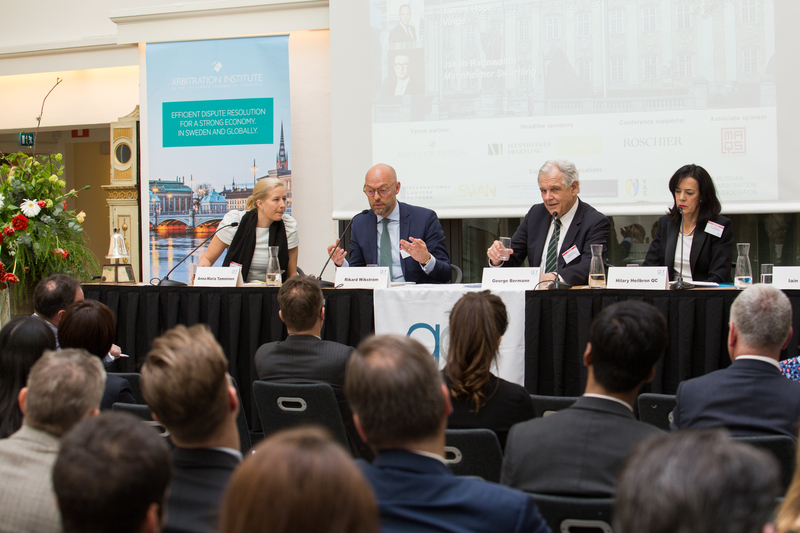 George Bermann, of Columbia Law School led a panel of four that comprised Rikard Wikström, of Roschier, Anna-Maria Tamminen, of Hannes Snellman, Hilary Heilbron QC, of Brick Court Chambers and Iain McKenny, of Vannin Capital, in a lively discussion of the central theme. Is it possible to generalise on this? Are there any common traits? Do sides spend too long considering the traits of their appointees, when what really matters is the chair? How much reading-in does the ‘good’ arbitrator do before the hearing? 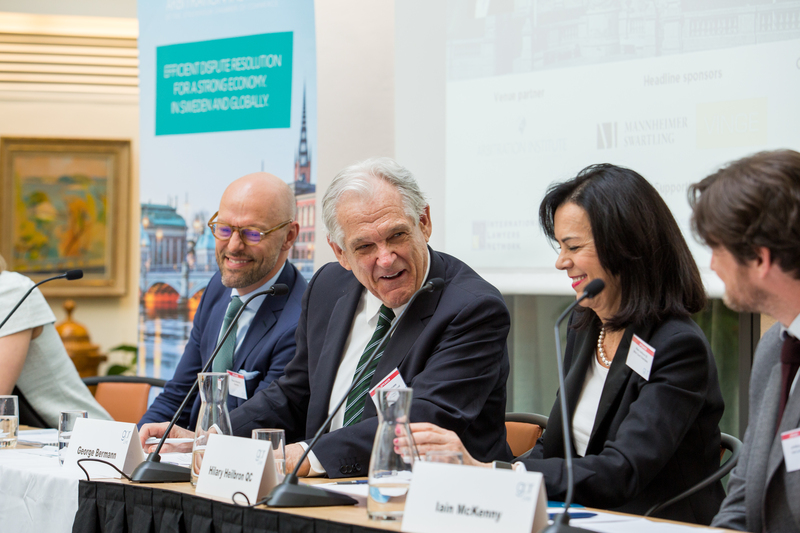 How does the ‘good’ arbitrator know when to push for greater efficiency and economy? Is it acceptable for arbitrators to interrupt? Is it necessary to address every argument in an award, or will addressing all the issues alone suffice? Should arguments be quoted verbatim or paraphrased? What should a chair do, if a wing arbitrator is battling too hard for one of the sides? The lively discussion includes several tips and anecdotes. George Bermann shared a tip he uses when one side asks for a timetable extension to inoculate against accusations of unfairness, while Hilary Heilbron shares a technique that can cut the size of any eventual Redfern schedule, and another that can reduce the need for a tribunal secretary. 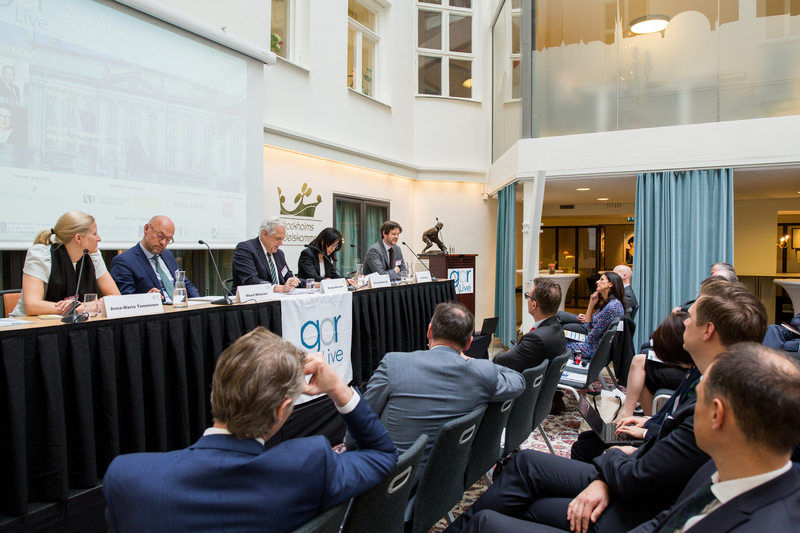 The conference took place at the Arbitration Institute of the Stockholm Chamber of Commerce, on 27th April 2017. 4. What makes a good arbitrator when it comes to production of the award? George Bermann: When I was asked to perform this task, I tried to come up with a sub-subject on which each panellist might share a few ideas about, and then launch a conversation. I said let’s first talk about the background and qualifications of arbitrators. We begin with some considerations having to do with the general approach of an arbitrator to the conduct of arbitration? I underscore the term ‘general’. We then become more concrete and look at specific practices that, by their nature, conduce to more effective arbitrating on the part of a tribunal member. Then we turn specifically to what makes a good arbitrator at the award-drafting stage. Iain has agreed to speak to the question of background and qualifications. But before Iain speaks, I’d like to share with you very quickly what are the questions I invited Iain to consider, without of course limiting him to them. First, can one speak meaningfully about a profile generally favourable to an arbitrator’s performance? I know some of us will doubt that. It will rather be a ‘it all depends’ kind of thing. But still, is there anything meaningful of a general character that can be said about the profile of a good arbitrator? Next, to what extent and in what circumstances do demographic considerations properly come into play? I’m thinking principally about nationality, age, gender, race, ethnicity and geography. When is it appropriate to consider the appointment of a specialist – perhaps so much so that you appoint a non-lawyer, an engineer for example. Finally, how important is the language facility of the arbitrator, and are there personality and character attributes that seem to be especially valuable? I have invited all our speakers to distinguish, in addressing these questions, between the chair and a party-appointed arbitrator. They may also want to distinguish between commercial and investor-State arbitration. Anna-Maria has just reminded me that we should also probably distinguish between the emergency arbitrator and, let’s say, the plenary arbitrator. Those were the modest set of issues I put to Iain. My background: I’ve worked with Freshfields Bruckhaus Deringer in London; I’ve worked with Latham & Watkins in Paris; I am an experienced arbitration practitioner, but I have never sat as an arbitrator (just to underscore that point). About five years ago I left private practice and was the first arbitration practitioner to work in third party funding for Vannin Capital. What is interesting is that I have since seen more disputes than I did in nearly 13 years as a private practice lawyer. 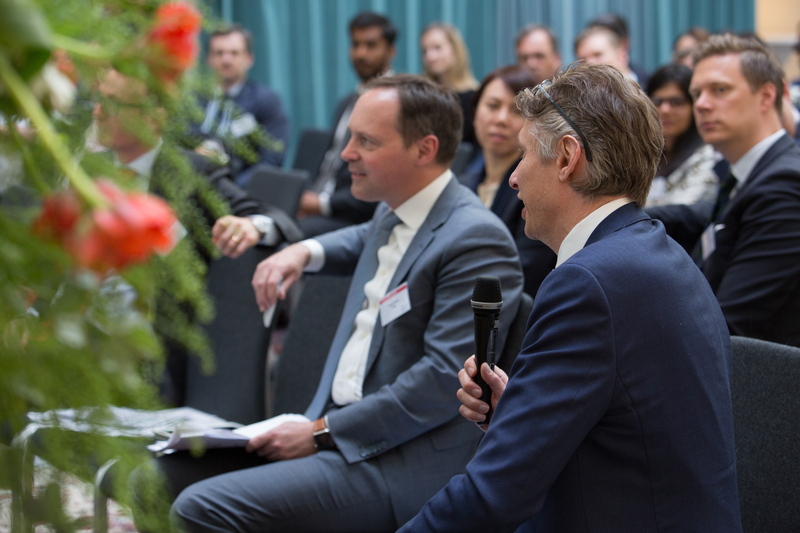 I’ve had some very interesting discussions with a variety of practitioners who are selecting arbitrators and having those discussions with their clients. I do not have that privilege anymore, so I think of it in a slightly more abstract way. I’ve tended to take a quantitative/qualitative approach when looking at the variables that go into the equation of selecting an arbitrator. I’d like to say that that’s all my own idea, but the qualitative/quantitative considerations are really Wittgenstein concepts in this sense. I like to split these up into soft variables and hard variables. The softer ones are more things like nationality, age, gender. These things do come into consideration, depending on the nature of the dispute, the parties involved and the jurisdiction. Then there are the harder, quantitative variables, like language, specialised knowledge, experience, known positions and time – increasingly time. How long does it take – there are an awful lot of inquiries as to the length of time arbitrators are taking to return arbitral awards. These are quantifiable, and you can plug them into a computer in the era of big data and crunch the numbers. There are many projects that have attempted to do just that, but the problem is that it doesn’t necessarily give you an answer. Well, it will give you an answer, but it won’t necessarily give you the right answer. That is because the quantitative assessment without the qualitative one is almost meaningless. This is not something that can be done in a vacuum. This is not something from which an algorithm can choose, and that is the temptation for many of these projects; a little tweaking along the way, of course, but essentially focusing just on those quantitative issues. The qualitative ones; it’s something I refer to as considering the tribunal as having something of the gestalt about it. That the component parts, the assembling of these individuals and how they interact, the considerations they have for each other, and their ability to communicate and work with each other towards solving this common problem is a massively important consideration – and a qualitative one. But here’s the rub. That very assessment, that consideration, is based on a concept of a lack of transparency. This is knowledge from within the community and it’s not widely available. When weighing up the quantitative and qualitative, are we better served by a more transparent system whereby arbitrators have something like baseball card type statistics. George Bermann: Thank you very much. I thought you were going to venture from that point into the character and personality dossier. Iain McKenny: This is a question that often comes up – the character, rather than characteristics – with an awful lot of clients. We develop very close relationships with these clients because our interests are tied closely to theirs. The lawyers are the ones who are guiding us and explaining their views as to why they would like to choose a particular arbitrator. I am often asked what I think of somebody and it’s very difficult to dispel the immediate first impressions that come to mind – the personality– but again I’d say that personalities are a qualitative assessment. You’re looking not only for the personality of your arbitrator, which may be tenacious, it may be fact-driven, or they may be a big-picture type, but also how they will interact with their co-arbitrators. The difficulty is that you can almost guarantee that the other side are going to be looking for a likely opposite – if you want a details person, they’ll want someone who takes a big picture approach. This is no bad thing. The question then becomes one of complimentary personalities so that the chair person or president has a balanced tribunal of personality driven approaches to help them understand the dispute from both perspectives – not claimant and respondent proponents but personality driven approaches such as big picture or detailed, for example. George Bermann: I want to give other colleagues a chance to chime in on this before I turn to you, Hilary, on the second dossier. Hilary Heilbron: Well, I’d just like to pick up on that last point, which is a hobbyhorse of mine. 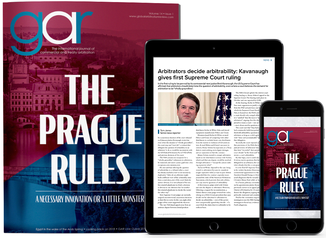 We all spend a lot of time considering appointees and, as has just been said, one side will try to choose its party-appointed arbitrator in the hopes that it will see the case from its perspective. The other side will do the reverse. I often feel not enough time is spent in considering the traits and personalities of the chair to which parties at the end of the day often only have indirect input through the co-arbitrators. The chair is the one who will set the tone of the arbitration; who will respond, hopefully speedily, to procedural issues to his or her co-arbitrators; and who, ultimately, usually does the first draft of the award after the deliberations. When we’re looking at this topic, we also need to consider not just the traits and characteristics of the separate party-appointed arbitrators, but what we want from a chair and how we can ensure the parties influence that particular appointment. That’s something that’s too often ignored by too much emphasis on one’s own party-appointed arbitrator. Now, one can assume he or she will appoint a suitable person, but that may not always be the case. The other point: I would not be doing my duty if I didn’t mention recent movements to ensure that more women are put on lists of arbitrators, because that does spread the potential traits and potential characteristics. Whereas, historically, the list was usually all men with the odd woman, now I think the trend is changing and that will change the dynamics as well. 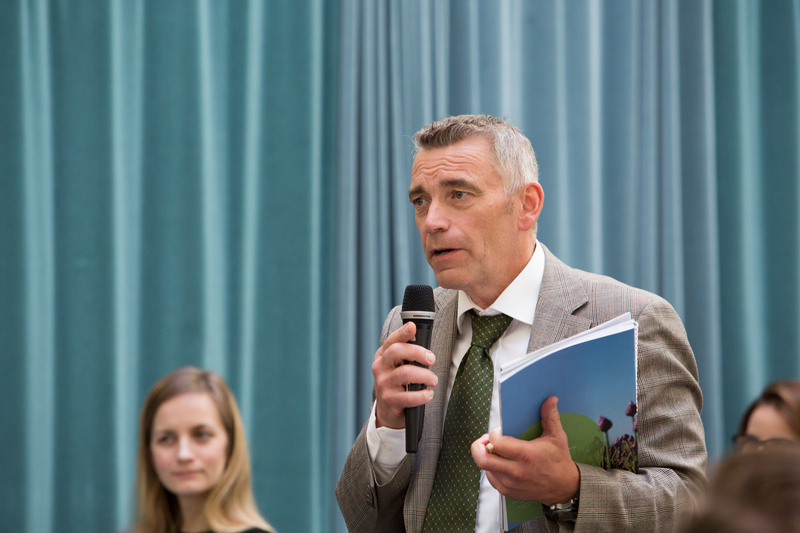 Rikard Wikström: I would like to follow up on one of the issues. You often end up in the situation where, in high-profile, politically charged or high-value disputes, you really must have an open mind when you’re appointing, and not rely on old ideas. I’ve sat as tribunal secretary with some big figures and experienced first-hand when you have a younger, hungrier arbitrator, in particular when there are lots of technical issues or documents, I wouldn’t necessarily be concerned about the status or experience of the arbitrator - unless you have a situation when it’s legally complicated. When you are a bit younger than the high-profile arbitrators, you tend to be a hungrier, more eager to dig into the documents and understand the technical aspects. It’s clearly an important aspect of the arbitrator choice. George Bermann: Indeed, there are so many variables that we couldn’t possibly discuss them all. One I’d like to put on the table is the following, going back to the party-appointed arbitrator for a moment. I refer to what may be called a “street fighter”, the arbitrator who will “go to bat” for the appointing party. Some counsel are attracted to that, while others more often say: “No, I think the credibility of the arbitrator I’ve appointed will be enhanced if he or she is not perceived as that.” Here is yet another example of a strategic choice. Anna-Maria Tamminen: It’s always a combination. It depends on whether you’re a claimant or a respondent because, as claimant, you call the first shot. Often what you’re aiming at is a chair with certain qualities. Then, who you appoint as claimant’s arbitrator or respondent’s arbitrator will influence what’s on the table after that, especially if the arbitrators are choosing the third arbitrator. We have to think carefully. 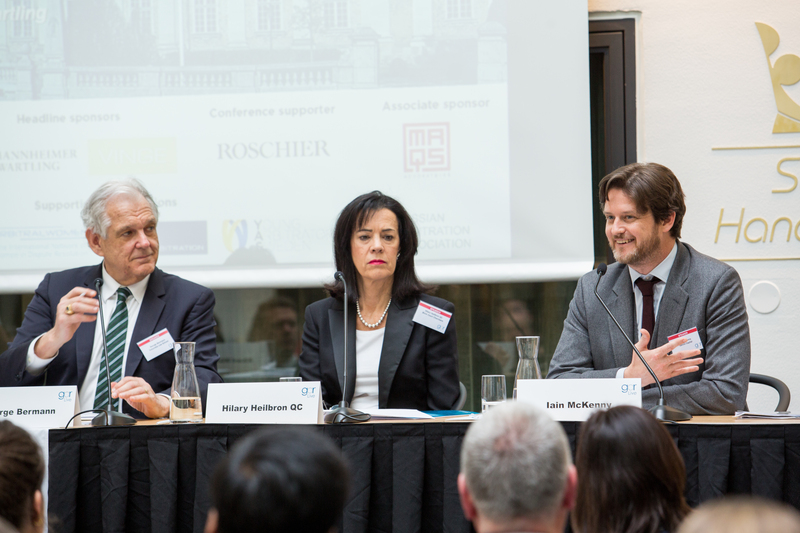 When it comes to the point of nationality – because these days I think the people who end up doing international arbitration are quite international by definition – often you find people whose nationality is one thing, but their legal qualification is something very different. Where it gets really interesting is who are they married to; which culture they “speak”. Often you’ll find an Englishman married to an Italian woman, and they get the culture perfectly. That is what you’d need for a certain type of dispute. 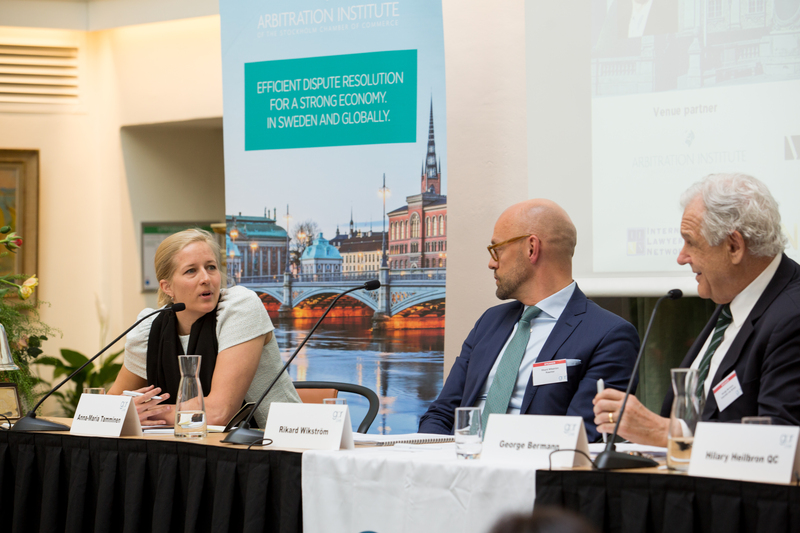 On Rikard’s point about age - I know there are institutions that have taken a stance whereby, even if you have very experienced arbitrators as co-arbitrators, they will put somebody younger in the middle. This might be a tough school to start your drafting career in, but you’ll be guided by very good people. I think that’s an interesting phenomenon. George Bermann: I want to turn to Hilary now. I tried to guide Hilary to focus on issues of style or strategy, rather than personal characteristics of the arbitrator. How does a good arbitrator navigate between a managerial and a more laissez-faire style? That’s always an important consideration. When should the tribunal’s interventions occur, and with what degree of rapidity and frequency during the course of examination? One may imagine an arbitrator who scarcely allows counsel to finish a sentence, while another scribbles questions on a napkin, waits until the end of examination, crosses out the questions that have been answered, and poses those that remain. These are extremes of course. The comes preparation for the hearing. What exactly, and realistically, should a good arbitrator should have done prior to hearings by way of familiarising himself or herself with the record? I come finally to a growing concern in the arbitration community, one that has already been alluded to today. 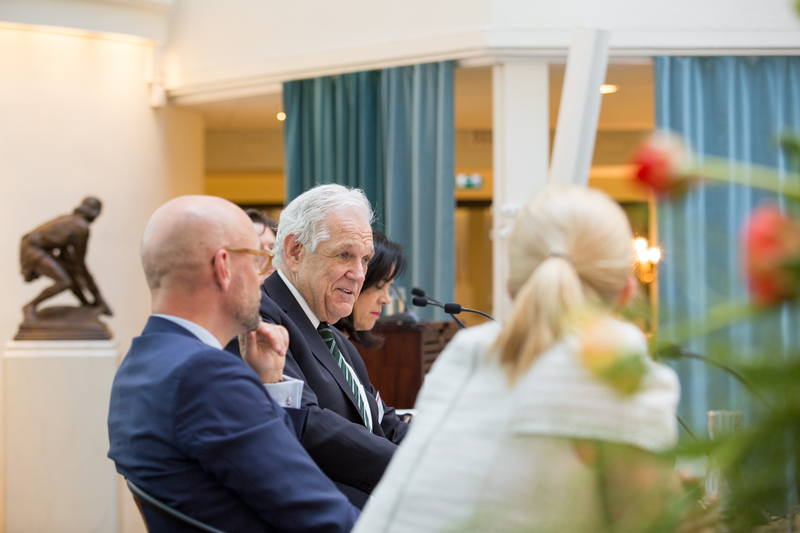 We increasingly see in arbitral practice a real tension between ensuring equality of arms, due process, and the right to be heard, on the one hand, and efficiency, pure and simple, on the other. One can be so annulment risk-averse on that you prolong the arbitration by (over-)indulging counsel’s procedural demands. It is true that arbitrators don’t care like to see their awards annulled, particularly on due process grounds, but at what price? I consider this a very important question and I hope it’s one that you will take up. 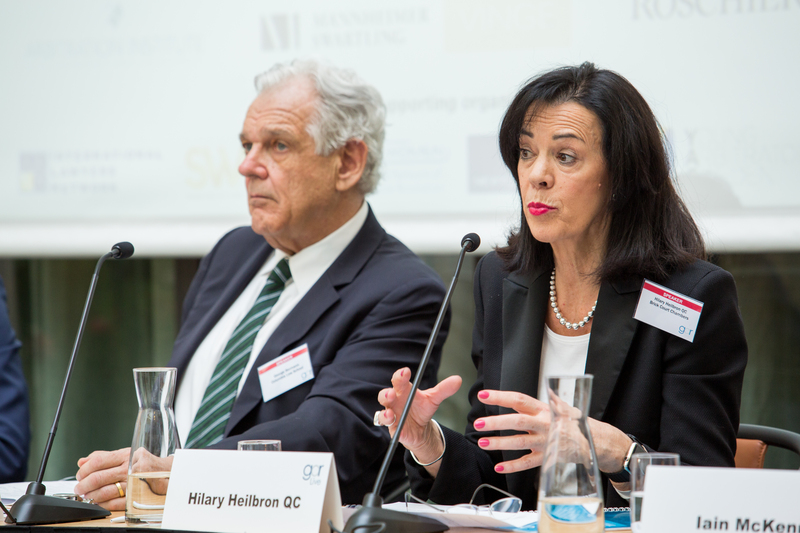 Hilary Heilbron: I have the advantage of being an advocate and an arbitrator, so I see it from both perspectives. When one sits as an arbitrator one always says, “well, I won’t do that when I’m an advocate,” but, of course, you always do. That said, let me start with some general propositions which I think are largely non-controversial. 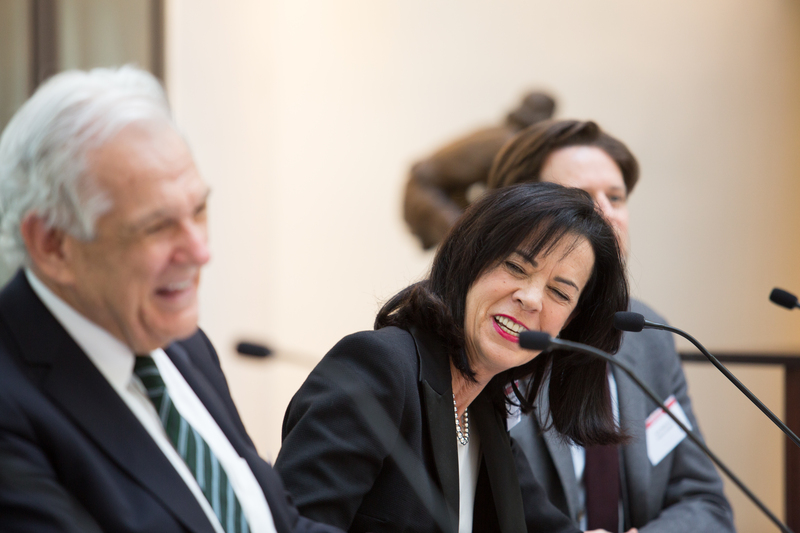 A good arbitrator clearly should be as on top of the case as he or she can be. He or she should have good interpersonal skills. You’ve got to get on with counsel and it’s particularly important if you can encourage them. You’ve got to have, at some point, a certain air of authority and you’ve also got to listen. Also, I think it’s important to have good managerial skills, to be proactive and to keep an eye (certainly if you are the chair) on what’s going on. Then I think the final general point is obviously you’ve got to be fair, but balancing that with the point that has just been made, which is efficiency. Let me come now to the particular: how much do you have to know when you start the case? Well, ideally, you should have read everything, but you probably won’t know the wood from the trees. A good starting point is to ask counsel to guide you in what you should read. I think it’s always helpful to read the key documents, but you can’t go through 30 files. At the end of the day, we all know that out of 30 lever arch files, probably 30 documents are relevant, and you’ve looked at just one file’s worth. If you can look at some of the documents, you get the real flavour as opposed to the witness statement. So, obvious things to look at are opening statements, witness statements, key documents, contracts, experts’ reports and anything else counsel guides you on. You do as much as you can in the time available. But it is important to be on top of what the issues are, otherwise you can’t really understand the evidence. And you should have read the witness statements before the witness gives evidence. That’s the first point. So far as managing the process is concerned, that would be the chair, but it is important to be proactive, to diarise certain things, particularly if you’ve got inexperienced counsel. If you’ve got experienced counsel you can be sure as eggs is eggs that, if somebody misses a deadline, the other side will be onto it; but just to nudge the parties along to find out what’s going on. This starts at the first procedural order. I’m one of those people who, when sitting as an arbitrator, likes to do a detailed procedural order. To some people it may be a waste of time because they know the procedure, but at least it’s there in black and white and you can refer back if something goes wrong. I set out various things that parties should do at various times. The other thing that is useful to do is to have a timetable at the end of the procedural order, so you can quickly check what’s happening next. So far as asking questions in cross-examination – being an advocate as well – I understand people don’t like their cross-examinations interrupted and often do ask a few questions – which may appear daft – with the idea of getting somewhere at the end of the day. I try not to interrupt counsel unless the witness doesn’t understand the question, if I don’t understand the question as arbitrator, or if there’s something obvious. For example, you might read part of a document, you’re moving on to another document and you just want to ask something. But one tries to save one’s questions to the end of the topic because, if it’s going to be a long cross-examination, it may be difficult to go back to something you have dealt with. I think the general principle is to let parties do their cross-examination and then ask your questions as best you can. The weight to be given to efficiency and economy in the light of this? Well, I do think arbitrators do have under certain statutes – for example, under English statute – obligations to ensure efficient process and, in a sense, that’s part of fairness. So, provided each party has an opportunity to present his or her case, one can try to chivvy the parties along. The difficulty arises when the parties agree a long timetable; it’s always worth exploring why. Now, it may be the parties are trying to settle it and therefore they want the time. Sometimes, you will find that there isn’t agreement; one party is dragging their feet. Then you have possibly to impose some slightly stricter timetables. At the end of the day, this is one of those “it depends”. But I do think there is an overriding obligation to ensure that costs and time are reined in as far as feasible. One question was: “Do arbitrators earn esteem by demonstrating procedural creativity over the course of the arbitration?” I have no idea! One hopes the answer is yes, but the answer is probably yes to one side and no from the other, so I’m not sure that gets us very far. George Bermann: That’s why I didn’t include that question in the ones I recited. Hilary Heilbron: The final question I was asked was: “When you’re appointed by a party, how far do you go in acting as a mouthpiece for their questions?” Some arbitrators take the view that if you’re appointed by one side and questions haven’t been asked – not necessarily cross-examination questions, but certain things haven’t been asked – you should ask them. I take the view that, once you’re appointed, you’re independent and should forget who appointed you. But there are various midway positions. 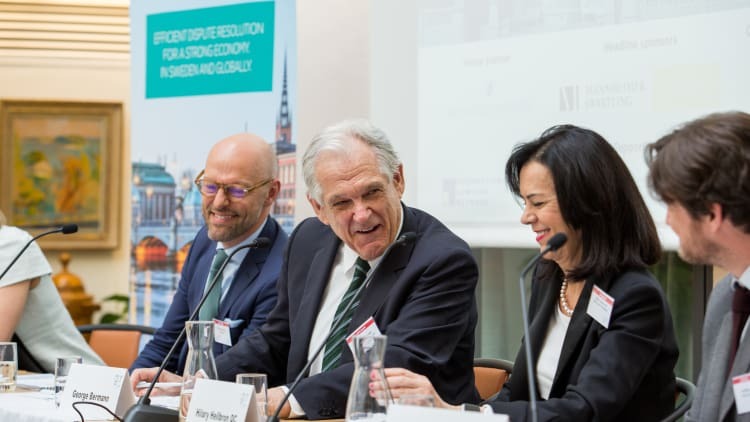 I favour the view that, once you’ve been appointed, you forget who appointed you except to say “good morning” as you walk into the arbitration room – although you should do that to both sides (laughter) …. I, for my part, don’t see that as an issue, but I know it is. You also get very extreme cases where arbitrators act as party-appointed counsel; that is not acceptable at any level. We have probably all had instances. George Bermann: Thank you. In Hilary’s responses, it became clear – and it is no surprise -- that on most of these issues we’re striking a balance between the due process demands and the efficiency or arbitral practice. We’re navigating between these two sets of concerns. I cannot resist saying that, on the question you’ve just raised, I discern in the United States a developing consensus at the verbal level that the role of the party-appointed arbitrator is simply to ensure that the case of the party that appointed the arbitrator was duly heard and understood, even appreciated. I guess the somewhat awkward inference from this is that the party-appointed arbitrator should have no interest whatsoever in whether the other appointing party’s case was heard and understood, much less appreciated; it’s your counterpart who will perform that function. How does one do this without compromising, or appearing to compromise, one’s independence of judgment. The question Hilary raises is whether one can you possibly be impartial and independent if one is approaching one’s role as arbitrator in this asymmetric fashion. The maxim I have just stated is by definition asymmetric and the challenge is: can you properly perform asymmetrically in this respect? 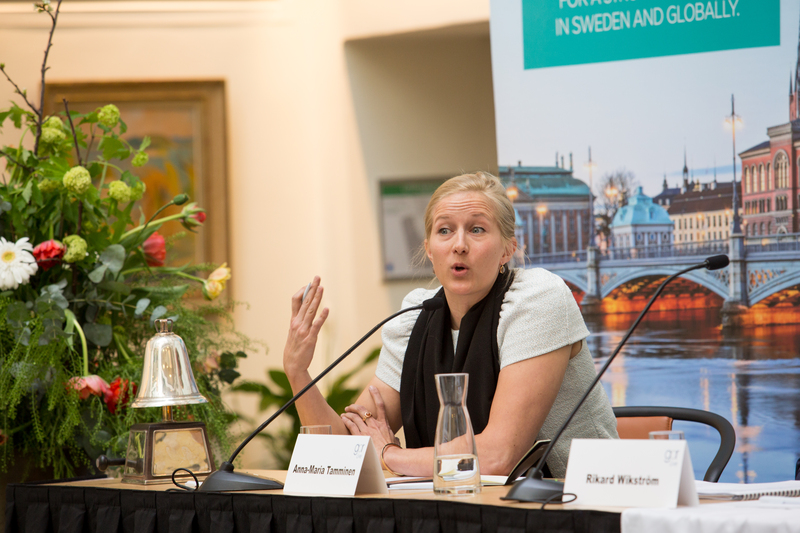 Anna-Maria Tamminen: On the asymmetry point you often see the counter-party argue, “this is unfair and we’re going to seek set-aside.” There are recent articles on this point as well. We should not be too afraid – or the arbitrator should not be too afraid – that on every single point of procedure, those applications are made. If there’s a party out there determined to seek the set-aside of the award, they will do it regardless of what it says in that award, because sometimes it’s not even up to counsel. If you’ve got instructions from your client to go all the way, you go all the way, and it’s often not overturned on those points either. So, you should stand your ground. I think in a lengthy arbitration there will be opportunities to go both ways. So, you give one party some leverage here and there will be the opportunity to give it to the other one; in the end, it evens out. What’s dangerous is if the arbitrators don’t show authority early enough because that’s when the big fights are fought; that’s when the ball is out there in the court and the counsel start playing. Rikard Wikström: I wanted to pick up on two things Hilary said. Interpersonal skills are a very important aspect of being a good arbitrator. Many arbitral rules now provide that we should have a case management conference early on, and I think that’s a very good thing. If the costs involved allow it, it’s valuable to have everyone meet in person, even if there are not hugely difficult issues to discuss. I think that’s important. On the issue of arbitrators asking questions, I have a pretty firm opinion that it should be at the end, after the cross-examination. First of all, it can be disruptive; counsel might be going into something, then suddenly there are questions from the arbitral tribunal that can cause difficulties. Also, with respect to fairness - typically you are under time pressure and must manage your time. If it’s suddenly blurred with lots of questions from the tribunal that go in a completely different direction, you find yourself in need of further time. The chair then forgets all about the 20 minutes of questions that ate into your time. That is why I think it should be at the end. George Bermann: I think that’s the prevailing view, at least on paper, but in practice I see a lot of deviations. Iain? 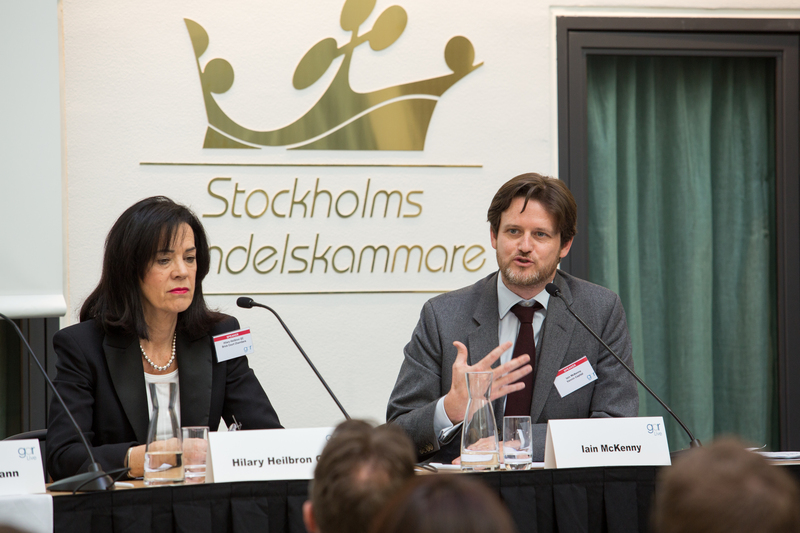 Iain McKenny: I have two comments, one with regards to the arbitrator advocates, as some clients come to know them. I spend an awful lot of my time talking to clients and they often struggle with this concept. To the uninitiated, the idea of a three-person tribunal (you pick one, the other side picks one) is already difficult, especially when you say: “But you’re picking an independent arbitrator.” As far as they’re concerned you’re picking your guy; you’re picking the person who is going to go to bat for you. Having that conversation is difficult because you’re trying to express to the client something we all know. There are arbitrators out there who regularly fight for their client when they’re their appointees. It does happen. It is a dirty little secret, but it does happen. We usually know who they are, and those people often don’t get repeat appointments in the long term because they’re known for adopting their party appointed position. 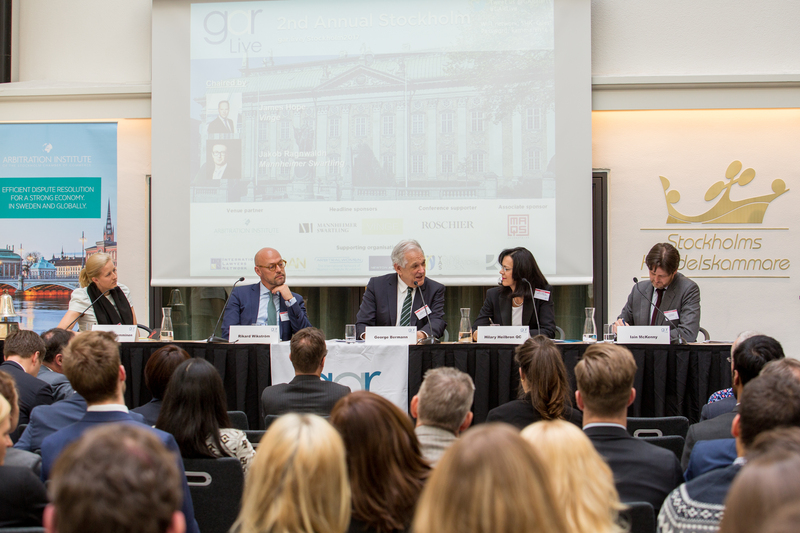 It gets known amongst the arbitral community, which means that they lose credibility on the panel. The second point was on proactively managing the process. I’m a founding member of Delos - a new arbitral institution that GAR kindly wrote about recently. 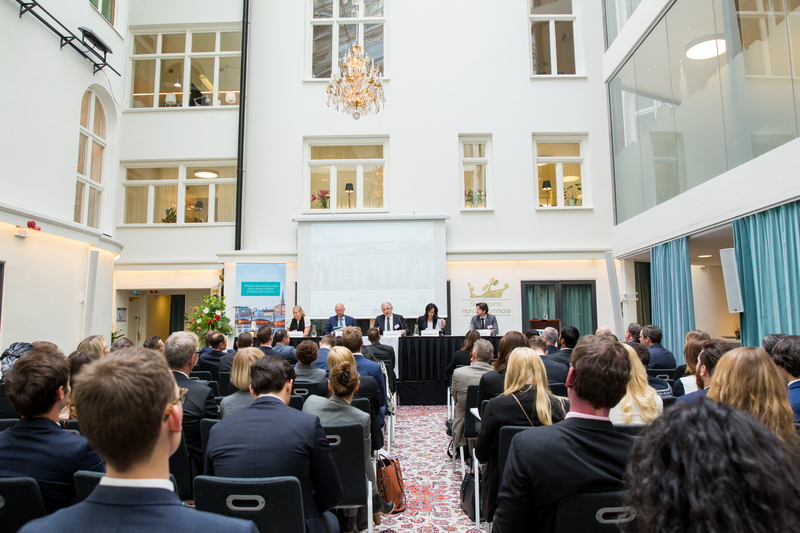 They focus on small arbitral disputes and are very keen on appointing arbitrators who take a very proactive stance. This is mostly because this small arbitration institution, which has recently released their first award, has a focus on time and cost. Arbitrators who more proactively manage their disputes have a better control of time and cost, which ultimately is to the benefit of smaller claimants who don’t have such deep pockets. 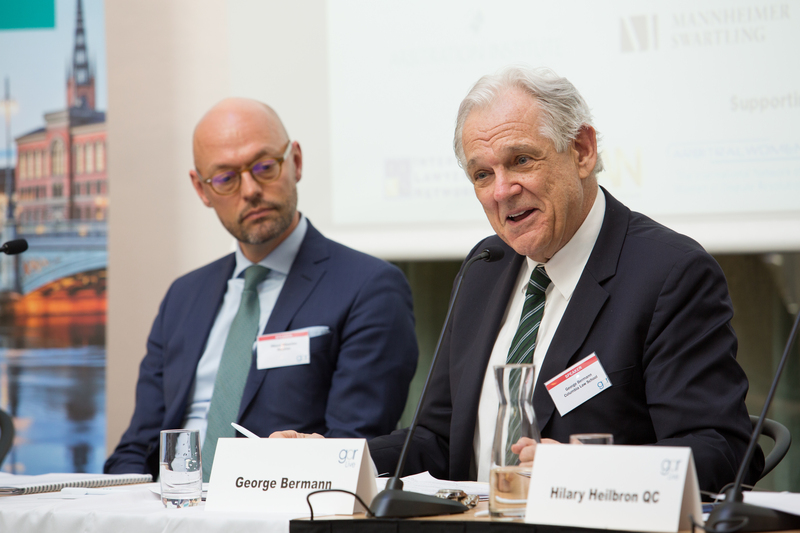 George Bermann: There is indeed a very important linkage between the emphasis you placed on interpersonal skills, on the one hand, and this question of advocacy on the part of a tribunal member, on the other. I’m chair more often than I’m wing arbitrator, and sensitive to the possibility that someone to my right or left is militating, for lack of a better term in favour of an outcome. Speaking for myself, this does not enhance that arbitrator’s credibility or his or her influence overall. That’s consistent, I think, with what you had to say. George Bermann: I want to turn to Rikard. Rikard, I somewhat artificially distinguished beforehand between matters of general personality and attitude, on the one hand, and stylistic considerations, on the other. But there is surely a whole battery of simple arbitrator practices to be considered. Some arbitrators will have a template of a procedural order number one and will, indeed, draft it and invite comments. Others, in the interest of party autonomy and encouraging cooperativeness between counsel, will say to the two parties: “Please get together and agree on everything in this case, from sequestration of witnesses to discovery.” I think they’re both respectable approaches. One is more managerial, the other more party autonomy-driven or, put less charitably, passive. Moving along, the attitude of a tribunal toward discovery is another important conduct issue. Returning to an issue we discussed earlier, counsel commonly seek dispensation in favour of the client from deadlines or from other ground rules that have been established. This will inevitably generate protest, typically clothed in due process. Not liking these moments, I’ve developed a little tool of which I’ve become quite fond of. If counsel asks for some such dispensation -- let’s say an extra two weeks to file -- and if I’m inclined to grant it. I always say: “I now want you to go back and reframe your request, including in it what you think the other side is entitled to, by virtue of your receiving this dispensation.” I also ask counsel to consider how to compensate for the calendar setback entailed in granting the request. I find this to be truly productive, and an important reminder to counsel that, if you want a gesture that is contrary to the ground rules, you owe it to your counterpart – and the tribunal and the proceeding itself – to make some effort at re-establishing some equilibrium. Arbitrators these days are also thinking about how many and what kind of signals to give to counsel during the arbitration. It could be productive because it could amount to a way of bringing counsel’s attention to what’s on your mind. It might promote settlement. I don’t mean suggesting what the outcome is likely to be, but signal the direction in which your concerns are heading. I find arbitrators thinking more and more about this signalling business. Unavoidable too is the question of the use of secretaries. It’s been all over GAR. It’s been in the Yukos case, although it was not the basis of the Dutch annulment. That’s a lot by way of arbitrator practice to consider. 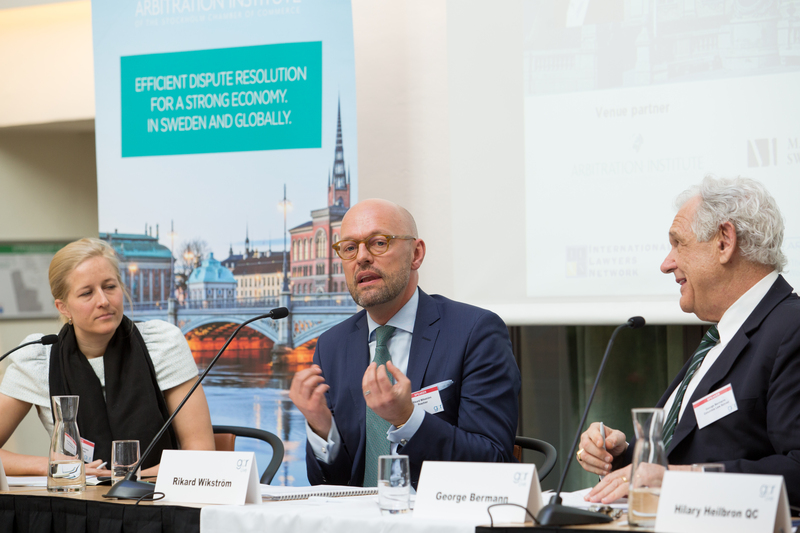 Rikard Wikström: We’re in the land of party autonomy, but there’s also an obligation as an arbitrator for efficiency in reducing time and costs, and also predictability for the parties. That’s why I feel so strongly about the first issue: the procedural order. Ever since I began as an associate, I’ve experienced these laissez-faire, very short procedural orders: here’s an address list; please counsel, agree on a timetable; and off we go. Inevitably, in every case I’ve had, the arbitration has derailed because there’s nothing in there about are the use of witness statements and when you file them. Is there a cut-off date? What happens if you submit a witness statement and the witness doesn’t show up? There are many issues and, of course, you can’t put them all into a procedural order. But a draft procedural order, a detailed one addressing at least the issues that arise every time – and I include document production – should be sent to the parties, encouraging them to liaise. If they want to tailor a completely different arbitration, that’s fine; but at least I’ve done my part. I’ve raised the issue before it becomes a real problem in the arbitration. On the question of dispensation - I put down that the timetable will be strictly complied with, and parties must provide strong reasons if they want to seek dispensation. My experience is that counsel get a chance to review this and discuss, and it does give you a bigger buy-in; an obligation to handle the proceedings efficiently. That’s a practice I look for with arbitrators and I would not reappoint an arbitrator with a “just let this be” attitude. It inevitably ends with expert reports filed at the last minute; you have to counsel the hearing; big procedural hoo-ha. That’s the first point. On secretaries, I’m torn because, having been a secretary myself as an associate, I learnt a lot. However, I’m critical of the use of secretaries when they become a fourth arbitrator. It’s important that we address it. I’m a strong believer in limiting arbitral tribunal secretaries’ tasks to the clerical and even associate use. To be appointed arbitrator is unlike many other matters; to my mind it involves a very high degree of trust on your integrity and judgment. George Bermann: Rikard, you mentioned guidelines on this subject. I think our institutions have begun to address this question. I’m familiar with many institutions that have put together a note suggesting the dos and don’ts of tribunal secretaries. A consensus may be developing. Obviously, the Yukos case was a dramatic one, one of those rare ones in which it was apparently demonstrated, through intervention by a forensic linguist that the secretary drafted the bulk of the award. It did not end up being decisive in the Dutch court, but this problem is now out there. Hilary Heilbron: I wanted to touch on a slightly different aspect of this. What we find is that a lot of correspondence is copied in to the tribunal, which is written at the behest of clients, thinking that the client will be impressed by the tribunal knowing what’s going on. That’s an awful waste of everybody’s time and money, unless something is wanted from the arbitrator. Now, I and a lot of other arbitrators say: “Don’t copy the tribunal into lawyer correspondence unless you want us to do something.” That’s one practical thing. The other side of the coin these days is that everything is done in writing. In the olden days people used to talk on the phone more. We now have case management conferences, which is a good institution because when you talk to somebody you can often cut through a lot of the rubbish; it builds up, and you get longer emails and letters. Whereas, if you talk, you can focus on the key points. One of the things I sometimes do, also in disclosure, is to ask the parties, before they send the Redfern Schedule, to pick up the phone and talk it through with each other because by then you’ve got reams and reams, and long columns. It sometimes happens that, if you deal with disclosure orally, things fall away. We shouldn’t lose sight of the fact that, aside from the personal contact at the hearing, personal contact going through the process is something that we should try to retain as much as possible. Iain McKenny: I like Hilary’s idea very much: the theory of encouraging the parties to try to agree issues and limit the amount of time spent on what are largely administrative matters, which have a serious impact on the running of the tribunal. Unfortunately, from my position in the trenches, it doesn’t always work out terribly well, which is a nice segue into what I’d like to say about Rikard’s point about strong control of deadlines. Putting my Delos hat on, I’d like to get your bio so that we can put you on as a potential arbitrator. I don’t know if this is something that is shared between the cultures: Sweden – or maybe Scandinavia generally – and the UK both have a respect for the queue and, perhaps, a respect for deadlines too. What happens in reality is that you’re still going to get the request and you’re going to communicate it to the other side. Even if they have strong reasons, you have some tools to say, “well, these reasons are not strong enough”; and shorten the time and make sure that it works with the rest. There are chairs who will delegate to co-arbitrators the responsibility for portions of the case. For example, if New York law is applicable and I’m the only person trained in NY law, I’ve seen chairs who’ll say to me, “you do that,” and say to the other, “you do that because you’re good at math.” Do we have thoughts about that? Chairs must also think about how important is it that the award not only addresses every claim advanced, but also every argument advanced in support of it? If a tribunal is intent on not just addressing every claim but also every argument, it will be a longer process. Some of those arguments may be inconsequential by nature or because the result was adequately determined on the basis of another argument. Now, the big issue, and you are expecting this, is the dissent. What is the real issue here? What is the threshold at which an arbitrator needs to arrive before being comfortable dissenting? I’m assuming that a threshold has to be reached, because if it’s a mere difference of opinion about some ancillary issue, a dissent should not happen. I have dissented only twice in my career, and in both cases partially. I don’t think many of us have dissented with any regularity. What I’d really like to hear are views on how an arbitrator goes about determining whether a dissent is an appropriate response. What makes a good arbitrator when it comes to production of the award? 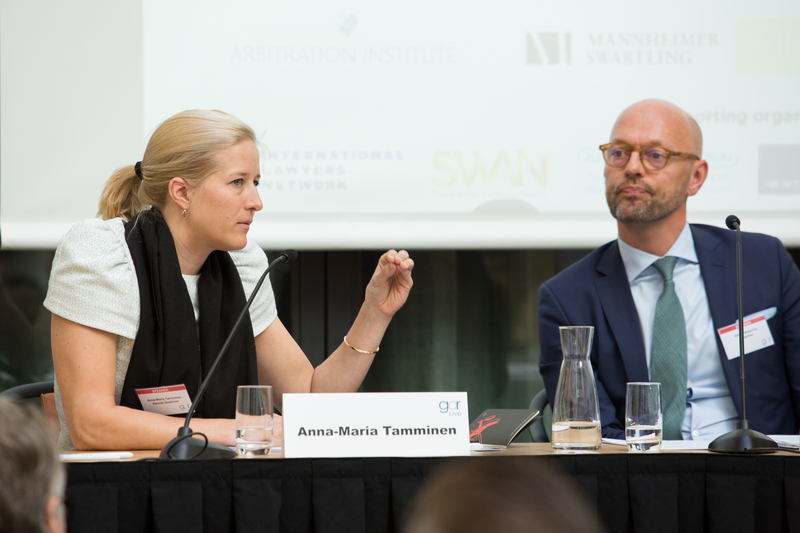 Anna-Maria Tamminen: My arbitrator experience is less than 10 arbitrations, so I come to this subject with some humility. On the point of who drafts, there seems to be a general consensus that the chair holds the pen and that’s what we were discussing earlier, when you pick your arbitrators. It’s a good question whether that should necessarily be the case. You see it, when the pen is given to somebody else exactly on a point, where one is qualified in the law and one has to write a very delicate argument about the interpretation of the law, for example. Or, when the arbitrators don’t necessarily agree on how to arrive at the result, but agree on the result. It’s helpful to let the person who is disagreeing draft out the argument because then you see where you might have differing opinions. Then comes the issue of dissent. You probably only dissent once you’ve had that discussion very specifically about: is this a matter of details or do we need to flesh out our reasoning? Is this something that we can add to or deduct from? It’s only when it’s an issue of law or fact where you totally disagree that this has not been proven on the basis of the evidence, or you disagree on the interpretation of the law. Here I’m borrowing an idea. I’ve been sitting at the SCC’s Arbitrator Training over the last year and we’ve had the great minds in this country teach us. A few weeks ago, we learnt that when you disagree you don’t fight with the majority, you set out your points. It was a good reminder to us rehearsing how to write a dissent because we’ve all made that mistake. I’ll come back to the expedited arbitration award drafting because I think it’s a slightly different animal. I think it must be said early on in a case: “I will draft shorter reasoning in expedited cases because that’s what you bargained for.” That’s now in the new ICC Expedited Rules as well. You have to be even clearer about what it is you’re writing about. What are my points and issues? What is the roadmap of the award-writing stage? Because you’ll have less pages and less time to get your work done in. Rikard Wikström: I’ll start with the dissent question. If it’s a true liability issue and I genuinely cannot accept that it’s been proven on liability, that’s when I must dissent. So far, it’s never happened. What I have experienced is a situation where I was in majority with the chairperson. We started having a discussion, going through the arguments. That was a good example of where the third arbitrator was not convinced, because then it would have been impossible to have that discussion. It was more a discussion that he had issues with whether liability was proven; then we ended up scrutinising certain parts of the quantum and reasoning our way to a final decision that we all felt was correct. I think that was good because dissent is really undesirable. George Bermann: It is undesirable, but we need to be realistic. If we are going to reduce dissents to a bare minimum, then there will be compromise. Of course, we don’t want Solomonic decisions by arbitral tribunals; that is not what we aspire to. But we need to recognise that we will have far more dissents than we do if there isn’t an element of compromise. I read you to say you might yield a little bit of ground on liability but come down on quantum. You have to pick your battles. Recently, the party that appointed me was about to lose, and did lose. It was a RICO case, in which the chair (not the other party-appointed arbitrator) argued for treble damages. I said to myself, I’m not 100% persuaded on the liability, but I can live with that. However, considering them altogether unwarranted, I must absolutely dissent from trebling damages. The party’s conduct was simply not wilful or wanton, and did not meet the threshold for awarding punitive damages. The chair backed off in the interest of avoiding a dissent. That may be a good example of what I was saying earlier about the role of the party-appointed arbitrator. I was very conscious of the fact that these treble damages were not warranted, and I was appointed by the party on whom those damages would have been visited. I held my ground. I don’t think that’s inappropriate conduct by the party-appointed arbitrator. Anna-Maria Tamminen: Had you have been the other party’s, would you have acted in the same way? George Bermann: I like to think I would, but I really felt this was an appropriate intervention on my part. I expect my counterpart would have done the same thing. He knew the legal pre-conditions for trebling and they simply were not established. Hilary Heilbron: Just a couple of points on the writing of awards. If it’s delegated to different people, one of the dangers is that not only is the style different – that’s one thing you live with – but inconsistencies creep in. There’s a much greater onus on checking that the document is consistent and factually right the whole way through. That’s a danger. The other point I wanted to raise is, when do you set out every argument? That’s one aspect of it. The other aspect is, when you actually set out the arguments do you, as I tend to, summarise the arguments, perhaps with quotes; or do you, as others do, set out the argument almost verbatim of each side? If I put it into my own words, I find that’s part of the thinking process in order to come to a conclusion. Others do not. I think there’s a sub-issue as to whether or not – because they don’t – that’s the sort of thing a secretary does: simply copy and paste the arguments. Iain McKenny: I want to pick up on the “addressing every argument” issue. Something I haven’t seen in arbitral circles, but English practitioners will be familiar with, in certain types of disputes. I’m speaking specifically about construction and engineering disputes. There is something known as the Scott Schedule, named after Lord Scott, who was faced with the troubling concept of: “do we address every single argument when we’re talking about literally hundreds and hundreds of arguments?” On that basis, I wonder whether there is scope in the international arbitration community, depending on the dispute, for something similar? Could we have something that allows a compendious list of the arguments to be addressed and checked off in full transparency and a conclusion drawn at the end from it like a Scott Schedule? The second point is on dissent. Lord Denning comes to mind as famously writing many, dissents and this made me think of something Anna-Maria said earlier about arbitration in Scandinavia almost creating law, and the basis for it. I don’t think we should dismiss the importance of dissents. There’s a potential value to them and, although perhaps difficult for the arbitration in a particular dispute, for the body of law itself they could be extremely valuable. George Bermann: Great, and with the little indulgence in time that I’ve been given, we’d love to have comments and questions directed to anyone on the panel in particular, or to the panel as a whole. Please honour us with a question or two. Audience member: I was very interested to listen to this topic and beforehand made a list of bullet points, so I could check whether you covered it, and more or less you did. One thing I did not hear, however, was the requirement of an arbitrator to be genuinely interested and curious in the facts and the law. I have the privilege to be counsel and arbitrator, and nothing makes me happier as counsel than when I feel that arbitrators are actually interested. Second, I took up a few points that made me think, “gee, being an arbitrator requires pretty much the same personality as being a mediator.” You need good listening skills, meaning an ability to reassure the parties that you have heard and understood. That pretty much addresses Hilary’s point about whether you should reflect the arguments (copying them) or whether you should reframe them. I’m for trying to reflect that you have understood and that may require a certain degree of paraphrasing. Separate the people from the problems – that will help you get along with most people – and have a nice day with counsel and co-arbitrators. I also like to see a natural authority that does not come from above, but from being able to get along and to decide, although you try to mediate the procedure first. Thank you. George Bermann: Thank you. Have we another comment or question? Audience member: This is directed to someone who has long experience of being a chair. When you have wing arbitrators of the type who fight for their client, sometimes it becomes very obvious at the hearing that that’s the kind of arbitrator they are. I’ve had that experience recently and it doesn’t feel good. I wonder how the chair deals with that? George Bermann: I’m happy to say I cannot recall a time, and it would need to meet a certain threshold before I would intervene. However, I’m confident that such a threshold exists, and I would intervene, because arbitrator advocacy at the level you describe seriously impairs the fairness of the proceeding, and there’s nothing in arbitration more important to protect. Again, I haven’t had occasion to do so, but I would very discreetly speak to that arbitrator and say it really is not in the interest of this proceeding to intervene in such a one-sided way. Of course, that’s a delicate thing to say to one of your colleagues, but I am sure there are occasions when it must be done. Does anyone want to add to that? 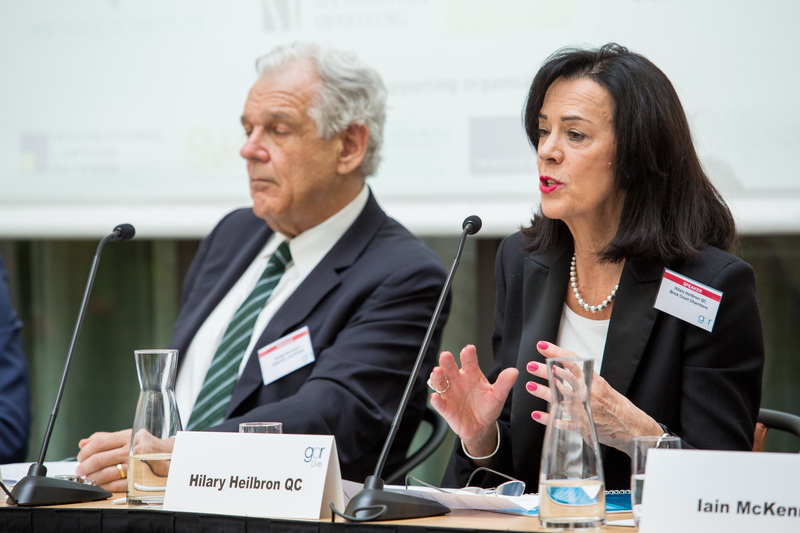 Hilary Heilbron: I haven’t had that experience. It is a delicate one, and you’ve got to try and find ways around it. The nearest I got was when I was chair and there was an arbitrator who appeared to send emails about our deliberations at the early stage to the people who had appointed him. By mistake, he copied me in and not the other co-arbitrator. I thought, well, I could actually just talk to him. What I did was send a series of emails around to everybody saying that all emails should be copied to everybody in the hope that somebody would get the message. Anyway, it settled, fortunately, but I think I might have had a problem on that one. George Bermann: We’re at the closing hour. I hope you agree that we had a lot on the table and dealt with it responsibly, even entertainingly. I want to ask the audience to thank my co-panellists for their contributions and thank the audience for its attentiveness and interest. 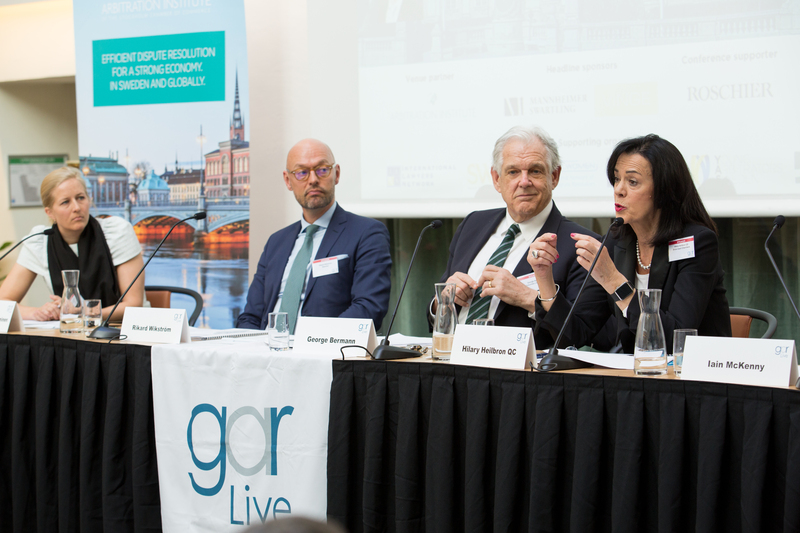 GAR Live Stockholm was held on 27th April 2017 at the Stockholm Chamber of Commerce. It was sponsored by Mannheimer Swartling, Vinge, Roschier and MAQS. The next GAR Live will take place in Atlanta on 6th March. 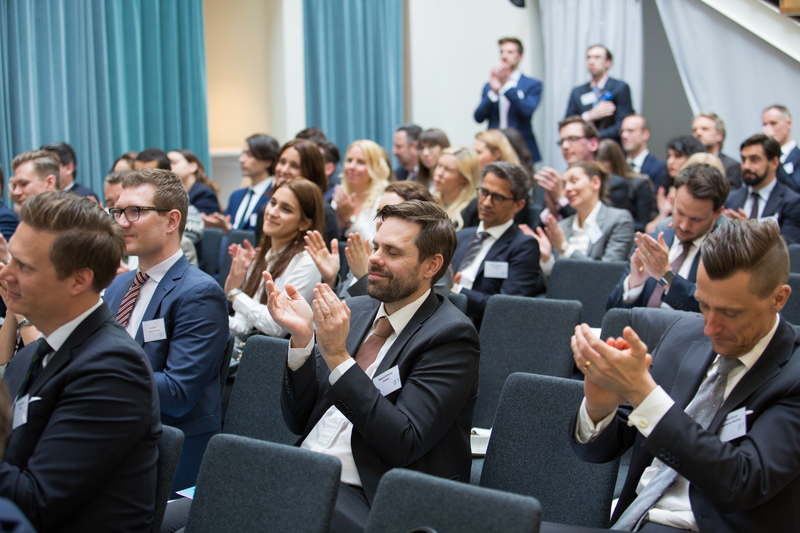 Registration is now open and is complimentary for in-house counsel. 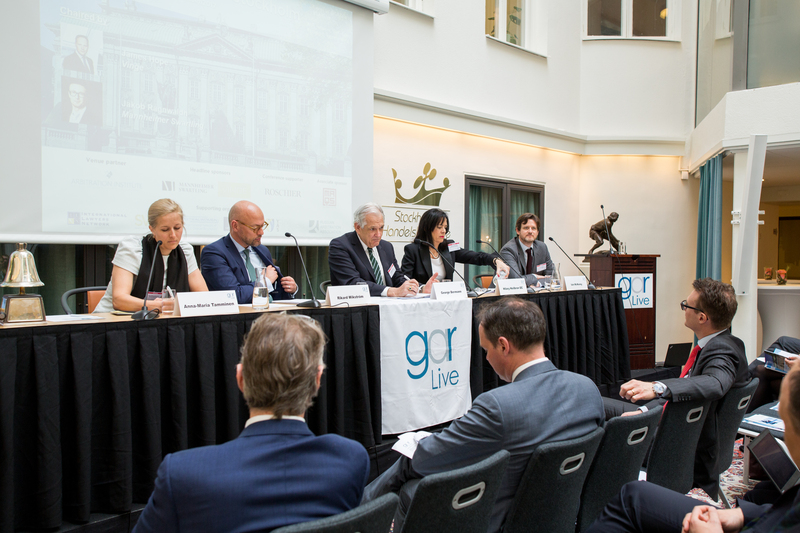 GAR Live lookback - Stockholm: what's the point of opening statements?